It all begins ... with a choice. In the third chapter of Stephenie Meyer’s phenomenal Twilight series, Bella Swan is surrounded by danger as Seattle is hit by a string of murders and an evil vampire continues her quest for revenge. 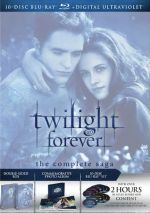 In the midst of it all, Bella is forced to choose between her love, Edward Cullen, and her friend, Jacob Black - knowing that her decision may ignite the ageless struggle between vampire and werewolf. $83.637 million on 4468 screens. To the thrill of 12-year-old girls all over the world, the Twilight franchise continues apace with 2010’s Eclipse. When last seen, teen drama queen Bella Swan (Kristen Stewart) found herself back with her vampire soul(less) mate Edward Cullen (Robert Pattinson). He wants her to marry him, while she wants him to turn her into a vampire. Edward agrees to do so, but only if they get hitched. Bella doesn’t think much of matrimony, so she resists Jacob’s proposal. Bella’s dad Charlie (Billy Burke) punishes her for behavior in the last flick, but he says he’ll loosen up if she obsesses less over Edward and spends time with other friends like Jacob Black (Taylor Lautner). However, Jacob remains miffed at her as well, so this is easier said than done. Eventually Jacob comes back to her and he ups the ante, as he makes his love for her better known. While Bella deals with her usual relationship drama – and the prospect of high school graduation in a few weeks – we learn of violence in nearby Seattle, where the city’s seen a string of mysterious and bloody killings. We learn these stem from an attempt of a vengeful vampire to create an army of newborn vampires to get back at the Cullen family. Probably the biggest problem with the Twilight films stems from their split personality. On one hand, they’re basic soap opera romantic triangle tales, but on the other, they want to be supernatural action flicks as well. That bifurcated nature causes a rift that the movies can never meld in a particularly satisfying manner. I suspect that these flicks maintain such a loyal female fan base because they accentuate the romance over the action. As a man – a damned manly one, at that! – I think this is the factor that makes it tough for me to invest in the tales, though I actually liked the relationship aspects of Twilight best. I felt the first movie developed the characters in a satisfying way and created something intriguing and unusual whereas its action scenes were perfunctory at best. Unfortunately, New Moon killed any momentum and became the worst of both worlds. The relationship sequences stalled, mostly because there was no heat from boring Jacob, the third side of the love triangle. The action sequences remained lackluster – and infrequent as well, so any spice they might’ve added was too little, too late. I think Eclipse rebounds after the mopey and dull Moon, but it doesn’t return to the moderate pleasures of the first movie. I will say its relationship moments work better than in Moon, largely because it includes more Edward. Gah, this will make it sound like I walk around the mall in my “Team Edward” T-shirt, but I do feel the movies tend to be more interesting when they accentuate his character. That’s partially because Pattinson is simply a better and more interesting actor than the hunky but dishwater dull Lautner, but it’s also related to the development of the characters. Edward gets all the rich backstory that comes with the life of an immortal, while Jacob is stuck with the bland mysticism movies slap onto Native Americans. They’re never given the chance to be more than Dances With Wolves stereotypes, so Jacob is just another one-dimensional role. And since Moon gave us tons of Jacob and not so much Edward, it sagged. Eclipse balances the characters better and adds some actual tension to the triangle, so that makes it a bit more compelling in the relationship domain. But not a lot, at least not to me. Again, I suspect the girls who eat up these films will be ecstatic at the romantic developments – eeeee! Jacob and Bella kiss! OMG!!! – but I don’t think they pan out as particularly interesting. If anything, these sequences feel a bit tacked on, as though they exist to give the movie complications that don’t evolve naturally. As for the action scenes, they’ve improved since Twilight, at least to a moderate degree. New director David Slade gives these sequences more bite and pizzazz, so the fight pieces offer some actual excitement; I couldn’t say that about similar moments in the first two movies. Unfortunately for the guys in the audience, though, the action scenes are too few and far between to keep things interesting. At its heart, Eclipse remains a romance, and it lives and dies with that motif. For many, it thrives; for me, not so much. Eclipse is definitely a more engaging film than New Moon, but it still drags too much and lacks a lot to make it truly compelling. Eclipse appears in an aspect ratio of approximately 2.40:1 on this Blu-ray Disc. The transfer kept pace with the visuals of the first two movies and looked good. Sharpness was solid. At all times, the flick exhibited strong definition and suffered from no notable instances of softness. No issues with jagged edges or shimmering occurred, and edge haloes remained minor. Source flaws were absent. As with the first movies, this one stayed with a restricted palette. Like New Moon, Eclipse tended to be a bit warmer than the teal Twilight, but it still didn’t exhibit a broad range of tones. Also like its predecessors, though, the tones appeared positive within their constraints. Blacks were decent; I thought they could’ve been richer, but they were fine. Shadows were about the same, as low-light shots offered acceptable to good delineation but never quite excelled. Even with those minor complaints, this remained a satisfying image that merited a “B+”. I thought the DTS-HD MA 5.1 audio of Eclipse fell into line with its predecessors. Like the first two movies, much of the audio concentrated on music and general atmosphere. The score and songs displayed nice stereo presence, and the film conveyed a solid sense of place. Also like its predecessors, Eclipse occasionally came to life for its action scenes. The movie didn’t include enough of these to make this a bold soundtrack, but when they occurred, they offered immersive material. Elements moved around the room well and meshed together to offer a good punch. No issues with audio quality emerged. Speech remained crisp and concise, and music showed good range; the score and songs appeared full and vibrant. Effects worked well; those elements seemed lively and robust, with nice low-end response to add depth. With more action material on display, the mix would’ve gotten a higher rating, but as it stood, it earned a “B”. With this 2015 release, we get both the film’s theatrical version (2:03:56) and an extended cut (2:08:40). As I noted when I reviewed the elongated editions of the first two films, I don’t know the various Twilight flicks well enough to identify specific changes. Perhaps big fans of the series will feel differently, but I can’t locate anything here that makes Eclipse better or worse. The extra material may flesh out matters in a minor way but the overall impression remains the same. That leaves the extended cut as a curiosity for fans. The disc opens with an ad for the Twilight Forever: The Complete Saga boxed set. No trailer for Eclipse appears here. 2010’s Eclipse keeps the Twilight train a-rolling, as the franchise continues to earn megabucks at the box office. I’m sure this flick will delight established fans of the series, but I don’t think it’ll do much for less dedicated partisans. 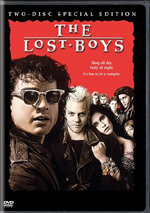 The Blu-ray provides very good picture and audio but lacks supplements beyond an extended version of the film. Fans will be happy to see the slightly longer cut of the flick, but I think Eclipse remains an erratic effort. 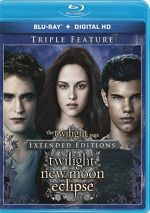 Note that the extended edition of Eclipse comes as part of a “triple feature”. This set also includes elongated cuts of Twilight and New Moon.